August 24th marks the five year anniversary of the release of Suzanne Collins’ final Hunger Games book, the international sensation Mockingjay. 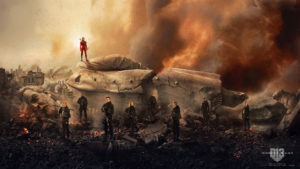 With the final movie of the mega-successful series coming November 20th of this year, Lionsgate unveiled a fun new microsite called Squad451.TheHungerGames.movie. It revealed the exclusive NEW “Fallen Snow” banner for The Hunger Games: Mockingjay Part 2, which you can download and use from the site. Check out the official Hunger Games website to view the trailers, an order link for the all new Tim Palin: Photographs from the Hunger Game book, and a way to order tickets for the all new Hunger Games exhibition at Discovery Times Square in New York City!